or from a small hill like a meerkat on sentry duty. 7:21 But first … what is the UK? The names Great Britain and United Kingdom are often used interchangeably. However, they are not actually synonymous. 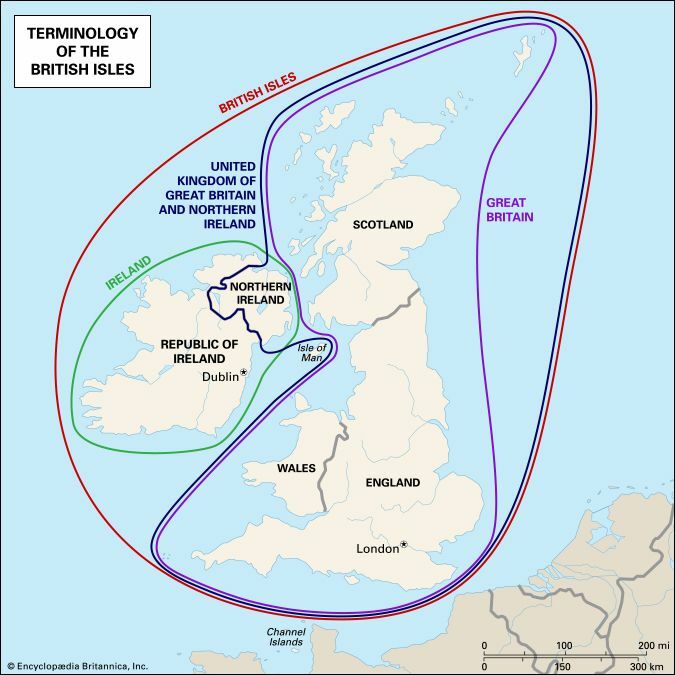 The reason for the two names, and the difference between them has to do with the history of the British Isles. Great Britain versus the United KingdomThe map shows the territories of the British Isles and the names by which they should be referred to. 11:19 The deal describes what Boris Johnson and others have rather old-fashionedly but not inaccurately called “vassalage”. For the whole of the ‘transition period’, set to end in December 2020, the UK will obey all EU rules but will no longer have any votes in any EU bodies. If a new trade and customs partnership is not signed by its end, the transition period could be extended to a date described in the deal text as “up to 31 December 20XX”. Well, at least the UK can know its vassalage won’t last beyond 2099. Once the transition ends the UK has agreed to a ‘backstop’ that would keep the UK in a customs union with Europe, following EU customs rules, and force Northern Ireland to keep following many single market rules and regulations, unless and until a trade deal is done. The backstop may never come into effect, because both sides say a permanent customs and trade arrangement can be negotiated before it’s required. Many observers take this with a grain of salt, noting how many years previous EU trade deals took to negotiate. And in the end the UK may still stay subject to EU rules, perhaps forever, because of the problem of the Irish border and the only solution that has yet been found to keep it seamless. 26:06 Here’s some breaking news for Baby Boomers. You’ve had a very good run and you’re just about done. Generationally, the biggest voting bloc is now the Millennials, born from the mid-80s to the turn of the century – and it is growing by 30,000 every year. 29:55 The company in question is Amazon, which confirmed earlier that morning that Long Island City, Queens, will become the site of its second headquarters (a third headquarters will be located in northern Virginia). The announcement ends a 13-month pageant that saw 238 cities and their elected officials prostrate themselves to CEO Jeff Bezos, only for the multibillionaire to move his company into two of the wealthiest metropolises in the country(New York and Washington, D.C.) and likely displace countless working people. And for this privilege, the state of New York will reward Amazon with more than $1.5 billion in incentives, while the city provides property-tax abatements for the next 25 years—this as it faces public transportation and affordable-housing crises. Amazon, meanwhile, will receive upward of $48,000 in subsidies per employee. In Australia, we do the same. Industry assistance in Queensland. The QCA has identified 112 measures providing $25.3 billion in assistance from 2013 to 2018, including $5.6 billion in budget outlays, $17.1 billion in tax concessions and $1.3 billion in underpriced assets and services. JS: Is there a difference in your view between the Democratic and Republican parties given everything we’re seeing now in the era of Trump? CH: Well, of course, there’s a difference. It’s how you want corporate fascism delivered to you. Do you want it delivered by a Princeton educated, Goldman Sachs criminal or do you want it delivered by racist, nativist, Christian fascist? When this is essentially what the Trump Administration, this is the ideology that the Trump Administration has embraced because Trump has no ideology. So, they’re filling his ideological void. But you know, and you’ve reported on this, the fundamental engines of oligarchic global corporate power are advanced by both parties and one attempts to present that in a kind of multicultural, inclusive way. The other is, you know, it kind of embraced by troglodytes. But there’s no way within the American political system you can in any way tame or challenge the war machine or Goldman Sachs or ExxonMobil. The crusade kicked off on Friday night with inspirational motivational speaker and Life without Limbs author Nick Vujicic. 42:02 Since 2005, Vujicic says he has shared the Christian message with 8 million people face to face and another 730 million through digital media. “God can use a man without arms and legs to be his hands and feet,’’ he told the crowd. He admits his faith journey hasn’t been easy with much anger and many questions as a child. While he says he still would love to be healed, he says it wasn’t for his incredible story he would not have been able to motivate and share with so many people around the world. He said the boy’s mother said she knew then that God still had a purpose for her son’s life. If you met him, would you try to talk him around to atheism? 46:43 Rev Gretta Vosper, 60, who was ordained in 1993 and had served as minister of West Hill United Church since 1997, has been upfront about her atheism and non-belief in the Bible for years. 49:40 In a sign Australia faces a “crisis of freedom”, The Weekend Australian can ­reveal a successful international wedding magazine that chose not to feature gay couples will today announce its decision to shut down after becoming the target of an intimidation campaign. “We hope that one day soon our society can learn to accept people’s differences and different points of view and love each other no matter what,” said the couple, who have been married for 17 years. 56:16 Scott Morrison: Look I’m a member of a religious community, and my pastor knows what’s going on in our church community. He would know, or his wife would know, if there was someone who was leading a local bible study group, or something like that, who is teaching things that is not in accordance with what our faith believes. And they’d be dealing with it, because that’s the responsibility of a religious leader. Australia’s first Pentecostal Christian Prime Minister has today been accused of sticking his head in the sand and not identifying clearly anti-social behaviour within his own religious community. This investigation marks the second time Jarryd Hayne has been accused of such crimes – leaving many political commentators to question whether or not his pastors and fellow churchgoers should shoulder blame for not identifying his criminal tendencies and reporting him to authorities sooner. 59:32 Crikey pays for its subscription with this article. ScoMo and his handlers had hoped they could turn him into Howard II, the suburban dag … Alas, he’s now like the chaplain brought in for compulsory RE who must endure 2000 years of theological questioning from teenage smart arses: … Morrison could be opening the new Bruce J Tingwell Drainage Hub in Dubbo and someone is still going to ask him if he prayed for better municipal waste management. This can’t be a deliberate strategy, can it? Australian suburban dagginess and religion don’t mix. Howard never mentioned God that I can recall, and even when he talked about Western civilisation, etc, it was usually in British terms, not on the Judeo-Christian thing. The school chaplains program was as cultural as it was religious. Morrison sees no contradiction in having a silver boat-idol on his desk saying “I stopped these”and worshipping a man who walked on water to save people in boats — no contradiction in praying for the children whose souls he is helping destroy. The Saturday Paper: While mystery surrounds Scott Morrison’s sacking from Tourism Australia, a buried audit report shows numerous anomalies and concerns over contracts worth $184 million. 1:04:44 Ever since Scott Morrison was sacked from his job as managing director of Tourism Australia in 2006, the reasons for his dismissal have been kept secret. Morrison began at Tourism Australia in November 2004 and left 19 months later. The Saturday Paper understands the events and issues the audit report outlines played a significant role in Morrison’s removal. Unconfirmed news reports have since alleged that he received a payout of more than $300,000. 1:06:42 Australia’s treasurer has hit back at Mahathir Mohamad’s warning that Australia moving its embassy in Israel could encourage terrorism by citing a history of antisemitic remarks by the Malaysian prime minister. The deputy Liberal leader, Josh Frydenberg, accused Mahathir of having form in making “derogatory comments” about Jews in the past, including calling them “hook-nosed”, questioning the number of people killed in the Holocaust and banning the classic Holocaust film Schindler’s List. Meanwhile, Christopher Pyne shows the character of this government. 1:11:00 Some moderates want Morrison to dump the idea, but government conservatives favour the shift. The defence minister, Christopher Pyne, repeated a position on Thursday that he favoured two diplomatic presences – an Australian embassy in West Jerusalem and a separate facility in East Jerusalem in the event of a Palestinian state – and he suggested that was the policy Morrison was currently pursuing. 1:13:18 A 69-year-old Dutch “positivity guru” who says he does not feel his age has started a battle to make himself legally 20 years younger on the grounds that he is being discriminated against on a dating app. 1:16:59 Finding out my father lied about his heritage has forced me to radically question who I am.